The Ultra Classic and other Harley-Davidson touring models were redesigned this year with the primary purpose of providing better ride and handling. A new frame provides thirty percent more overall rigidity by using fifty percent less parts and welds. The primary purpose of the redesign was to increase strength and torsional stiffness and this seems to have been accomplished. Less flex is felt when moving from side to side and when leaned over in a curve. A new 17-inch front wheel and Dunlop multi-tread dual compound rear tire contributes to the increased cargo capacity and overall vehicle stability. With retuned suspension, a slight increase in rake (from 25 to 26 degrees), one-half inch greater wheelbase and more cornering lean angle, the Ultra Classic feels like a new bike even though it looks the same. Harley calls this “classic style meets modern technology” to give their customers the looks they want in the chassis they need. The bike is a little bit heavier overall but the total carrying capacity has gone up by an astonishing 70 pounds! With standard amenities like cruise control, AM/FM radio with CD player and built-in speakers with handlebar controls, the Ultra can coddle you in comfort for the long haul. Add the standard tour trunk and saddlebags and you can bring it all with you. Whether setting out on a day trip or going cross-country, the Ultra Classic has always had the looks and comfort. Now it has the handling and ride to match its styling panache. Evolution can be a good thing indeed. Base price: $20,999. 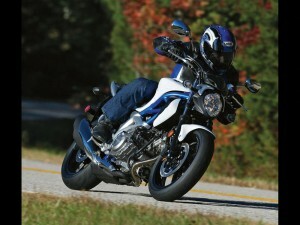 The Gladius is a middleweight replacement for Suzuki’s beloved SV650 model. It uses a 645cc liquid-cooled, V-twin in a modern steel trellis frame. Engine torque has been shifted downward for a more linear powerband, with better low and mid-range power and a 10,500 RPM redline. Uniquely styled based upon flowing lines and edges, the Gladius stands out in a crowd. The chassis and fuel tank junction has been narrowed and the front of the seat rounded for a 30.9-inch seat height to allow entry-level riders to put both feet on the ground. Dual floating front disk brakes with twin piston calipers provide enhanced stopping power. Dunlop Qualifier radial tires grace five-spoke, 17-inch cast-aluminum wheels for improved traction and low unsprung weight. The 41mm front forks and single rear shock absorber are adjustable for spring preload only. Available in blue/white or black. Base price: $6,899. 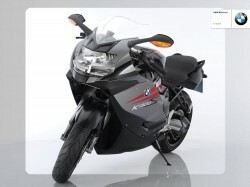 The K1300S is BMW’s completely revised, top-of-the-line sportbike. It has a liquid-cooled, fuel-injected, inline 4-cylinder engine upgraded to 1293cc that cranks out a claimed 175 horsepower. Unique engineering solutions abound through the motorcycle including its “Doulever” front suspension, “Paralever” rear suspension with single-sided swingarm and a shock absorbing two piece drive shaft. An optional ESA II electronic suspension adjustment system lets the user manipulate damping and spring rate on the fly to customize ride and handling. Large dual-disc front brakes have 320mm rotors and four-piston calipers with standard integral ABS. BMW has also finally eliminated its confusing three button turn signal switch and replaced it with the industry standard single switch mounted near the left handgrip. Options include heated grips, gear shift assistant, electronic suspension adjustment, traction control, tire pressure monitor, alarm, luggage rack and no-charge low seat. Available in Lava Orange Metallic, Light Grey Metallic and Sapphire Black/Granite Grey/Magma. Base price: $15,250. 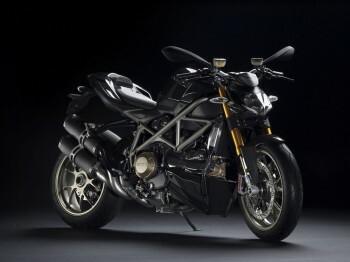 The Streetfighter is the Italian bike maker’s naked superbike. A stylish beauty with performance to match its looks, the Streetfighter is a stunner. With a claimed 155 horsepower and 85 pound-feet of torque, the Streetfighter is a more rational version of Ducati’s 1098 sportbike. Its liquid-cooled, 1099cc L-twin motor uses 4-valves per cylinder with Desmodromic actuation where each valve is both opened and closed by the camshaft and employs no valve springs. The Streetfight has upright handlebars, more rake and trail to increase stability and a 1.4-inch longer swingarm that stretches the wheelbase to 58.1 inches. Tires are 17-inch Pirelli Diablo Corsa III radials. Front brakes are twin, semi-floating Brembos with 330mm rotors and Monoblock four-piston calipers with dual brake pads that should yield serious stopping power. Available red or pearl white with a base price of $14,995. An upgraded model, the Streetfighter S, has upgraded Ohlins-brand suspension, light-weight forged Marchesini wheels, traction control, data analyzer and some carbon-fiber pieces for $18,995. The Fury is Honda’s version of a custom chopper. Based on the VTX1300, the Fury has sleek lines, a raked out fork for that chopper look, stretched wheelbase and emblem-less teardrop fuel tank. The Fury is unique and stylish but still has Honda’s typical high fit-and-finish, reliability and quality. A 1312cc, SOHC, 6-valve liquid-cooled V-twin powers it. A five-speed transmission mates with shaft final drive. Over 73 inches of wheelbase, 38-degree fork rake and 26.7-inch seat height provide the prototypical chopper riding position. A hidden rear shock allows the rear fender to be mounted close to the wheel with its 200mm-wide rear tire. It provides 3.7-inches of travel and is adjustable for rebound damping and spring preload. A color-matched frame adds that custom touch. Available in Ultra Blue Metallic, Black, Metallic Silver, Dark Red Metallic, Matte Silver Metallic for a base price of $12,999.